From the past one month I was really busy developing a new WordPress theme. The name of the new theme is WP Perfect. WP Perfect is a two column SEO optimized WordPress theme. WP Perfect has built-in control panel to adjust the basic settings with the click of mouse without editing the php files of the theme. WP Perfect has modern looking jQuery powered theme options page which offers better control options to its users. The theme options are available under Appearance tab by the name of ‘WP Perfect Options’. General: If you want to use the custom favicon for your blog, you can paste the URL of your custom favicon in this tab. Author profile box can also be enabled or disabled from General tab. Header: You can use your own image logo. Just paste the URL of the image. You can also enable the secondary menu to use Google Links Ads from Header tab. Sidebar – Social Widget: Sidebar social widget tab enable or disable the social widget in the sidebar. Simply paste your user ID’s and widget is ready to use. Sidebar – 125×125 Ads: This widget is used to display banner ads of size 125×125 in the sidebar of the theme. Just paste the URL of the banner and link to it. Footer: From Footer tab, you can control footer widgets. You can also paste your stats or tracking code like Google Analytics code here in the Footer tab. Now upload the wp-perfect folder to ‘http://yourblogname.com/wp-content/themes/’ directory using any FTP program. Wow. Looking cool man. Theme is really nice. Congrats bro. Its simple, Great looking theme, looking forward for Thesis version toooo. Thnx a lot for releasing it for free of cost. Will have a look at your theme. I’m also in the process of creating a theme. I have actually created the theme options already and using it on my own blog. I now need to make it link to a theme. Do let me know what you think about the theme when you try it. It’s great you also going to release a theme. I’ll be waiting for your theme too. Well, at this stage my options can be incorporated into any theme just by calling the functions itself. I did it that way just in case others wanted to use my features on their current theme. I have also created my own widgets for the subscription, recent posts, recent comments, text and banner ads, category posts, etc. All the widget settings are easy to change/update with drop downs boxes, ect. From entry level to advanced level users will find it easy to manage and alter. I thought that maybe I will release a plugin for the widgets, but I still want to create more and then it will cater for a wider range of WP users. I will probably publish a post about the widgets to get some kind of feedback from my loyal followers. Simrandeep this is superb theme. However i would like to give you one suggestion. It will be great if you change the color of CopyRight area to blue, in this way your blog link will be more visible to the users. + The footer will look more attractive. Thanks for your suggestion. I will try the blue color as suggested by you. Wow this is a really awesome theme…. 🙂 Really Liked it…. The theme uses only 3 small images. I also used CSS sprite in this theme. have you submitted it to teh wp repository ? I haven’t submitted it to WP directory yet. Waiting for response from users. I have tried my best to test this theme to fix all the bugs but still I want other users to test this theme. After that I’ll submit it on WP directory. You are right. CSSJockey is from India and he is from same city Chandigarh. Hello Simrandeep, Really nice theme, if I got this theme few days back then I’m one this theme user (Remember I’ve asked some help in few days back?) . Theme looks nice, but you can improve adding some extra functions like auto thumbnail image on home page, 2 column at below the Recent Post option, making tabbed widget to show more thing in less space. I’m glad that you like the theme. I’ll introduce the suggestions that you gave in next version of the theme. Some features like auto thumbnail and tabbed widget in the sidebar are already in the queue for next version. Nice theme! I’ve switched to WP Perfect for our 2Dolphins site. I can “trial & error” my way thru, but what’s the optimal image size for the header? Great news Simrandeep, will check this theme. 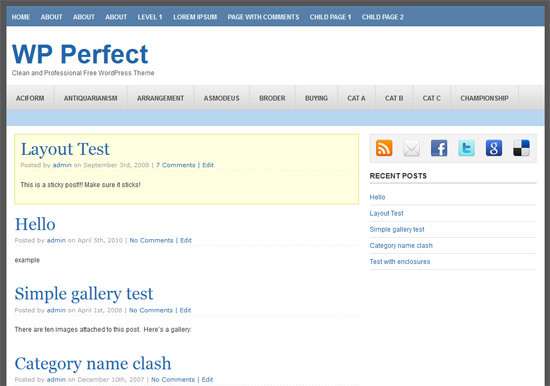 WP Perfect seems to be a perfect theme for WordPress blogs, it is seriously awesome, I am impressed by the demo. Thanks Akash for nice words about WP Perfect. More features will be introduced soon to this theme. Really awesome theme. Will review it in my blog soon. Thanks for the theme. Got word of this theme from HellBoundBloggers. Installed and configured it on localhost and fell in love instantly. I’m planning on using on it on a client’s blog as soon as possible. There’s one thing that bothers me though. I don’t like showing all pages and categories in the top navigation bar. How do I go about configuring header.php to only show pages and categories that I want to be seen up there? I’m getting nice words about this theme from all of its users. I’m really glad that you too like this theme. Did not you check the WordPress custom menu option of this theme ? You can use your desired categories and pages with custom menus. Both the navigation menus of this theme support custom menu feature. If you have any queries about this theme, you can always comment here. Let me know if you have any other doubt ? The theme is simple yet stylish. I believe that you have optimised it for seo and fast loading ! but still it is a good work. This is really nice ! But I’ve got a problem with the theme-options.php file. So I can’t do anything because I can’t save my options. When you downloaded the theme ? First few downloads might have got the error but later this error was removed and this theme works fine. Try to download and install it again and if you again get the error then leave your comment here. I erased my database and launch a new setup of wordpress (wordpress-3.0.1-fr_FR). But the problem ist steel there. I didn’t have any idea of this error as I’m not getting such errors with this theme. Which version of WordPress are you using and where exactly you get this error ? You are right Shafar. I really worked hard for this theme. Thanks Sagar.. Your blog is on maintenance mode. Superb theme!! Works good and also looks good! I really liked your theme … great work. I have a question here before i start using this theme. – Are there child menu to category menu too? I didn’t add the option of child menu to category menu. If you use Google link ads below category menu then child menu can’t be used. They will be against Google TOS. If you want then I can add it for you to your theme. There is no problem in that. thanx for the reply … but its not working. I tried the theme but still there are no child menu options to category pages. Give me the URL where you are using this theme. actually i applied this theme in my website only. I activated it. But it was not working so i deactivated it again. Hey guys! Thanks for the nice theme! It looks really good! I customized it a little bit and wanted to add some plugins. Unfortunately it is not compatible with any SEO plugins. I tried the AllinOne SEO plugin and the Platinum SEP plugin. And every time I want to change something within this plugin, WP redirects me to the wp perfect edit menu without saving my seo changes. Afterwards my custom wp perfect header is gone! Does anybody know a solution for that? I was not aware that it is not compatible with these SEO plugins. I’ll syrely fix this bug ASAP. Thanks for reporting the bug. Do you face any other problem with this theme or any other incomatibility with other plugins ? No..that was the only thing I saw…Do you need further information to solve it? I can give you screenshots or login details or you try it on your own and see if you have the same bug?! I’ll release the new version soon with the fix for this bug. Till then you can try the above method. I am very glad that I found the WP Perfect theme. It is very professional. There is only one glitch. When I create 4-6 subpages and mouse over the main page, the list of subpages opens. And it is overleaping the categories menu below the title. When I go down the list of subpages with my mouse as soon as it crosses the categories menu, the pages submenu closes. I cant scroll down to the bottom list of subpages. This is the only minus. But I ranked it 5 anyway in WP org. If you could fix this, I would really appreciated. First of all, Great THEME!!! Second of all, I am having the conflict with All in one SEO. The workaround is not working for me…I await the update. Thanks again for this beautiful theme! Hey thanks for your comment about my theme. I will release the update after Diwali or in the month of December. Till then you have to wait. Sorry for the inconvenience. oddness: I installed FotoSlide and when I click on the add new gallery it pulls up the WP Perfect Settings. Any suggestions? This is really simple & elegant theme. I’ll surely use it in my upcoming blog. Please share url of blog on which you are using. Or at least provide a demo. will sure use this skin if i use thesis on my blog… actually i always messed up with code so, i am afraid to use thesis..
Thesis is really easy to customize. You can easily customize it according to your taste. Whenever you want to use it on your blog, do let me know. I will help you out to purchase it for cheap price and for customization too. ssa ji.. can you tel me how to add page navigation in this theme? the wp-pagenavi plugin doesnt work with this theme.. Thanks!! Is this theme u using in your blog?? I really like this theme! Thanks for sharing. Wow… Really Good One… I Customised… Its Coooooooooool LoL!!! Thaaanq Very Much Bro. It is the bug in this version. I’m fixing this bug and will release another version soon. Do one thing. First activate the all in one seo plugin and then activate the theme. Then it will work perfect. Awesome theme Simran, So much perfect theme for wordpress. Is there a way to change the Title font. My Title is too long and gets cut. You can change font size within this tag. hi.i downloaded the theme.love it.but am having troubling trying to compact the posts into summaries.All the posts are each published in full.How do i compact a post to about 5 lines? I really like your theme but I am having a couple of problems. Whenever I make changes to other settings or adding other banners using Max Blog Press Ads for example, the theme settings all revert to the default settings. As a result, I lose my custom header, header banner, 125×125 add block, and social media buttons. Is there a fix for this? Thank you in advance for your reply and have a blessed day! Simrandeep, did you get my email? Just double checking, because I had selected “send a copy to my email”, but I never received it. I might have entered a wrong email address. Either way, this is my real one. Hello, I love your WP_Perfect theme and I am using it now…however, I have noticed that when I try to install and use Plugins with this Theme, every time I update the options of any of the Plugins, it RESETS all my options in the WP_Perfect Theme manager page!! Is there any way to fix this and keep it from happening?? Is this a known issue?? Please let me know, as I LOVE the theme but also want to be able to use Plugins with it. Love the theme. I have a problem loading a background image. I go to Manage Themes, then click background. I upload a jpg image, so far have tried 300×300 and 1280×1280. After pressing upload, the screen jumps to theme options page. I go to preview the blog at http://www.rewirereading.com and there is no change to the background. Am I doing something wrong? Hi. I love this theme’s look, but I too am having problems. When I go to change settings in some plugins, I am taken back to the WP Perfect Options page and the Options are all reset. Please help! I love this theme. This is the only problem thus far. Thank you for the great theme. I am unable to rate it on wordpress. First of all, this theme is absolutely great, but there is an issues that i have spoted: the homepage isn’t displayed on search engines. I mean the pages yes, but the home page is not. I believe it is a code problem or specification related to the header. Please change that. You can check the size of logo in the images folder. How to show all categories in header because header only show few categories not all ? its very gud theme ..